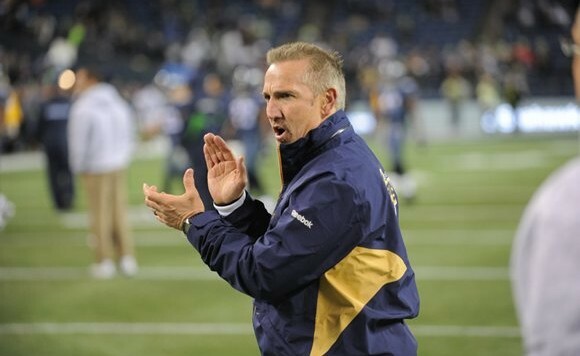 Perspective From Titletown: Could Patience On Spagnuolo Pay Off For The Rams? If (probably when) the Rams fire Spagnuolo, they will be making a huge mistake. Whoa. Bold words, but let’s get some perspective here. His game management skills and use of the challenge flag produced head-scratching at best, howls of derision at worst. Most damning, he had the gall to take an active role in the dismantling of the team’s old roster, and worked hand in glove with the GM to sign the guys who were now not producing, and ready to turn on him. Perhaps the low point was being called a thin-skinned control freak for firing one of the team’s maintenance crew over a perceived slight. Of course, I’m talking about Mike McCarthy, circa 2008. The same guy went on to coach his team to a 37-11 record over the last three seasons, won the last Super Bowl, and is currently managing the NFL’s next best shot at perfection. Perhaps that experience motivated Packers writer Aaron Nagler of Cheesehead TV, to say what he did on Twitter on Tuesday morning, and then spend the next hour vociferously defending his words to cranky Rams fans who just want to bury their heads. A bit more of that exchange, for those who missed it, after the break. Rams fans spent the morning after yet another awful loss in quiet, apathetic slumber, wondering if today might be the day Spagnuolo’s head might join Todd Haley’s and Tony Sparano’s on this week’s pikes outside the NFL’s walls. So needless to say, Nagler’s unprompted opinion hit me like a cold slap. For those who don’t follow him, Nagler is a well-respected contrarian, a football thinker who banters regularly with the likes of Pro Football Talk’s Gregg Rosenthal, Yahoo’s Doug Farrar, CBS Sports’ Pete Prisco and Mike Freeman, and other members of the hyperactive second tier of NFL cognoscenti that scurry around below the lofty thrones occupied by the likes of Adam Schefter and Peter King. So basically, when a guy like this says something that runs completely counter to my thinking, it makes me want to know why. What followed was a very interesting dose of perspective. Q (from me): If the Rams were your team, if this lost season was your season, how would you approach it? Nagler: Approach what? The offseason? I’d draft well, and come back rested and ready. They need to get healthy more than anything. Q (from @SportsbyWeeze): “Big mistake?” My question would be based on what? Coaching aside his decision making & personnel choices leave much to be desired. Nagler: You just described Mike McCarthy after his first two years on the job. He just happened to have Brett Favre. Q (from @Joben74): What do you see as the problem if not Spags’ poor decision making? Nagler: McDaniels is the issue, more than anything. Spags makes a lot of the same decisions McCarthy did early on. He’ll learn. However, lest you think that all these out of towners are aligned in their praise for Spags, PFT’s Gregg Rosenthal jumped in with a more cold-hearted perspective. @greggrosenthal: Spags’ D was a far bigger disappointment than O this year when it mattered, even when healthier. Nagler: 2 years not enough to turn around what he inherited. Deserves 1 more year, imo. Plus – he’s a good coach. As Rosenthal later pointed out, though, a big difference between McCarthy’s situation and Spagnuolo’s is their contract situation. Spags’ is up after this season, and it’s a tall order to ask for an extension when you have a mere ten wins to your name.